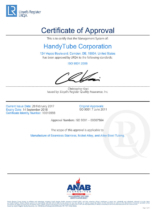 HandyTube consistently provides the highest-quality products and services. 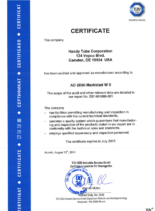 We do so by ensuring our raw material is of the highest integrity, thoroughly training our teams on procedures and documentation and implementing stringent quality control throughout the production process. 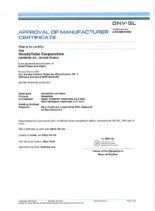 All quality systems are fully documented and satisfy or exceed ISO 9001 certification requirements. 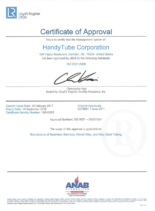 These systems extend into every step of our manufacturing process, where we have built-in quality checks to assure compliance with manufacturing guidelines and customer requirements.